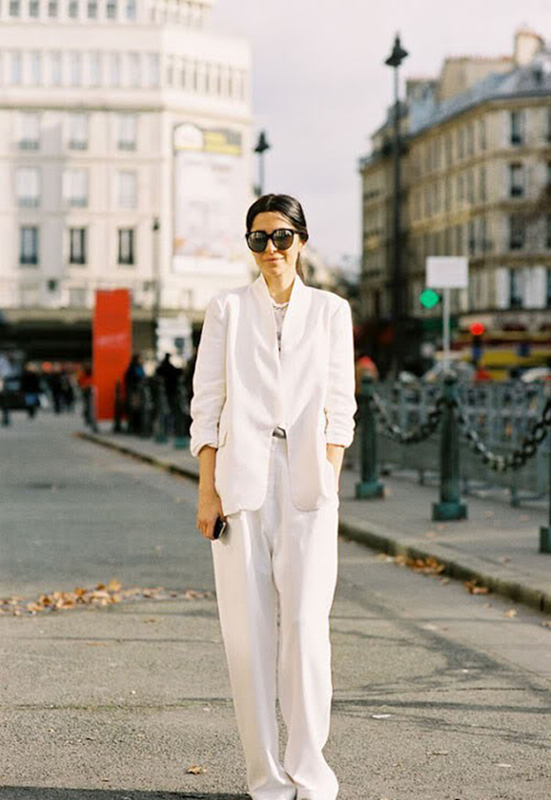 A pant suit is no longer considered to belong to male closet only. This outfit can easily be incorporated into your wardrobes as well. For one thing, it creates a very elegant and exquisite image – perfect for your office dresscode. Also, the elements of a pant suit can be donned separately, which is always nice as you can play with various ensembles. Lastly, if you want to create an impression of a very serious business lady (even if you are not in reality), this is the best way to do it. We can go on and on with the list of benefits that this adorable article of clothing brings. However, it is more important to focus on what the pant suit of your dream should like. As you can imagine, there are plenty of saucy variations and it is up to you which one to choose. Let me start with one of my favorites. A striking pant suit in navy blue features classic skinny bottom and a matching blazer. 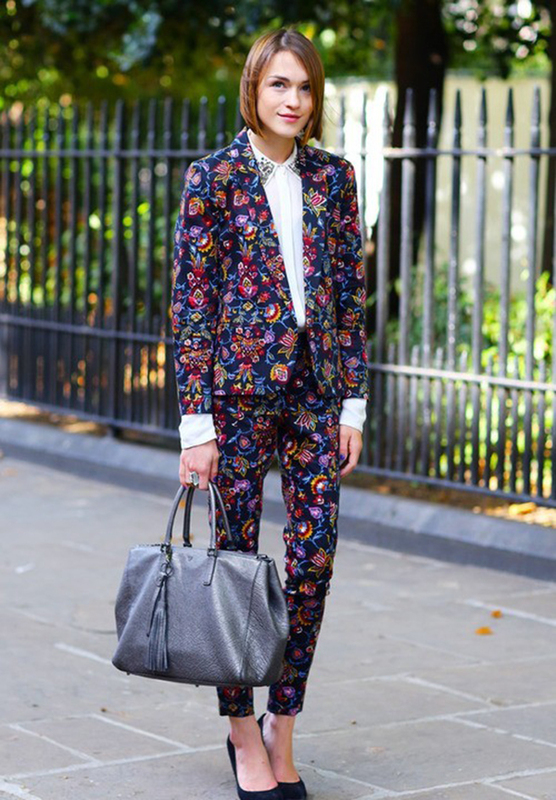 The most outstanding detail here is the print – something between paysley and florals. If you opt for such an outfit, it is important to remember about the balance rule. Which means that you ought to add a plain shirt, preferably in pastels, a classic pair of shoes (in this case it is black) and an elegant handbag. More delicate look can be achieved if you go for pastel colors. For instance, this adorable suit in cream creates an incredibly fresh and exquisite image. What came to my mind the moment I saw it was a snow white yacht floating across the Indian ocean and a band of musicians fiddling with violin and fleute. Flare pants add up to my beautiful scene, as I can clearly see them moving along with the sea breeze. I would play more with the accessories though and add some brighter hues, but it is all up to you. An extremely aristocratic impression can be created with the help of this awesome ensemble. This black and tan suit embellished with tiny florals is so marvelous that it is impossible to glance away. An excellent outfit to wear to a business meeting or attend some fancy trainings. Besides, the moderate and classic color palette makes it easier to come up with the styling part. If you love to always be in the spotlight, then you will totally love the next outfit. Lust red maxi blazer and matching bottom do not need to be described. The color tells it all. The only thing I have to mention here is that you will have to watch out, once you are sporting such an ensemble. People might just stumble and fall right before your sky-high legs, which you ought to be stressed by a pair of super high heels. The best complementing shade here would be black, as it will offset the vibrance of the main outfit and keep the hot hue. In case you like to stand out with your incredibly unique style, here is a gorgeous option for you. This playful pant suit in charcoal gray will make one stare at you for hours, not able to look away. There are so many untold things about this outfit, that it is impossible to not draw attention. Everything from the baggy silhouette and somewhat masculine touch to the hidden vest and trendy tie hypnotizes and allures. To create even a more engaging look, you can add an elegant hat and some cool glasses. With such an intricate ensemble there is no need to go for heavy jewelry pieces or bright accents. A sophisticated handbag or clutch and a pair of moderate heels would be just enough. Fans of smart casual, cheer up! I have a terriffic offer for you, ladies. This plaid suit with high-waisted pants is exactly what you need to rock the streets. The color combination is what makes this piece so special. Deep indigo is complemented by delicate white and faded red, all together creating a magnificent palette. The suit looks somewhat baggy, but in this case such a fit is an advantage. The styling is also worth of mentioning, as gold buttons bring in a precious touch. Obviously, such a piece should be paired with a white (or any light-shaded) shirt – the less embellishment the better. The most important detail to look at is your footwear choice – no heels this time. A pair of loafers or oxfords will work out the best. Some good news for the candy lovers – here is the sweetest pant suit in the world. This lovely piece is styled a-la vintage and features capri pants and shortened button-free blazer. It is all about the shade here – candy pink makes it absolutely impossible to not fall for this saucy ensemble. The outfit can be easily complemented by a white shirt (as it is shown on the sample) or by a top of a more engaging shade, such as light mint, turquoise or lemon. I would also go for a brighter pair of shoes, as black looks sort of heavy here. And of course, you are absolutely free in terms of accessories. Make the look as glamorous and playful as you can. Another incredibly elegant look is made up by a sophisticated checker-printed suit in white and gray. The lovely pattern makes it look absolutely adorable and along with the matching elements creates an image worth dying for. Black chiffon blouse with a white collar is the right choice for this outfit as it adds a luxurious touch to the look. White pumps and a monochrome handbag complete the ensemble and leave the sweetest impression ever. If you made up your mind on a pant suit of your dream, do not postpone your purchase. There are not so many things we can cheer ourselves with and you should use every single chance to do so!